Left: Dru Ish climbing the Elephant Tree in the Glen of the Downs, Wicklow County, Ireland, 1998. The Universe speaks to us in so many ways. Coincidence and synchronicity are those subtle voices that call me to listen for messages that this loud, consumer driven world drowns out. 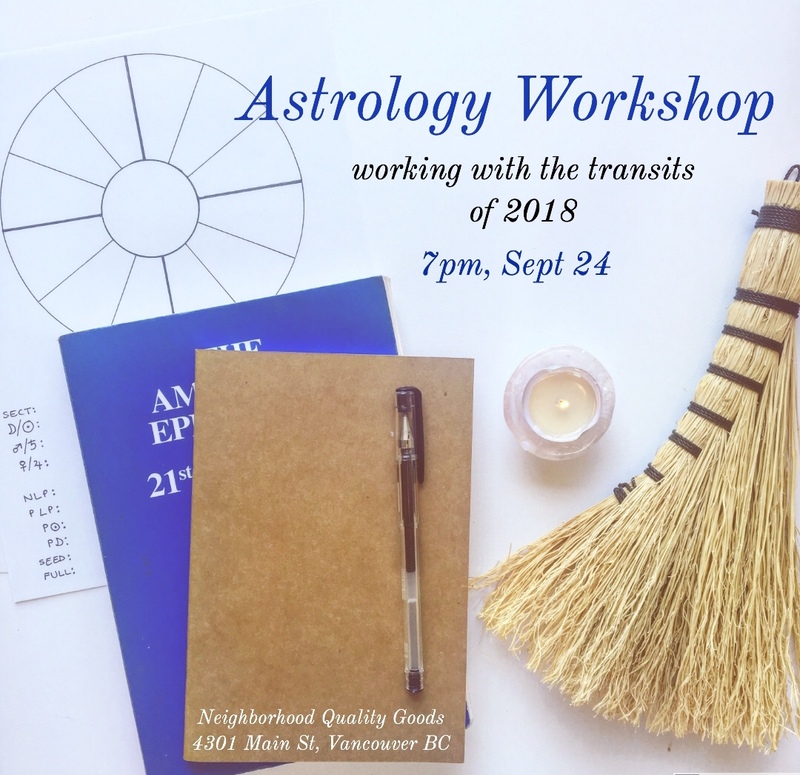 Taking the leap to follow the call from Saturn in Sagittarius and hit the road this summer, I have often been overwhelmed by a familiar feeling of freedom and how I navigate it. The feeling comes when I find myself hovering between where I’ve come from and where I’m going, knowing that where I am is exactly where I’m supposed to be. It’s familiar because I did a similar thing when I was 19. I left Australia and traveled for 12 years. These similar feelings now arise, but something’s different. I’m different. I’m 20 years older. 20! Back then I was in the if-I-could-bottle-this-energy-I-would Uranus square Uranus, & now I’m approaching the opposition. Pluto was in Sagittarius, now it’s Saturn. The view is different, but the essence smells familiar. We slept in the Redwoods on our way down from Canada to California. This had been a dream of mine for those last 20 years. While there, I found Julia Butterfly Hill’s Book: The Legacy of Luna. Coincidence? I was so energized to be reconnected to part of my own story through each page! 20 years ago, when she wrote this book, I was part of Ireland’s first environmental activism protest in the Glen of the Downs (1996-2001). While we were defending the Glen from the Celtic Tiger eating up the Irish country side, Julia Butterfly was defending the Redwoods from Pacific-Lumber in Humboldt, Cali. 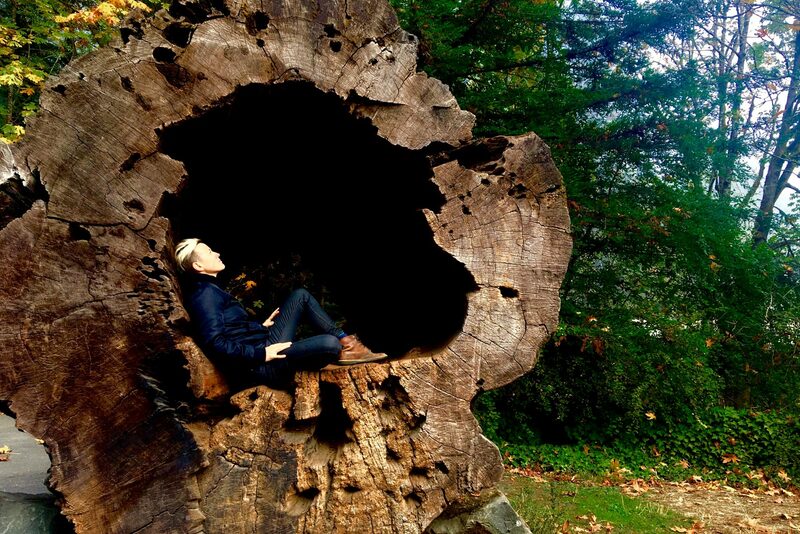 We were in Beech Trees & Oaks, she was in a Redwood. She lived in Luna, I lived in The Elephant Tree. While she was in USA, we were in Ireland. Geographically separate, together we were fighting the same fight: putting our bodies on the line as a statement against the increasing force of capitalism that was pushing us further into a state of disconnect from the planet, and disturbing us from living our connectedness to everything. The devastating effect of this disconnection is so evident today in the isolation-loneliness epidemic that plagues us and the fact that we’re still having to fight the government-corporate amalgamation to protect natural resources and sacred lands. The list is as endless as our fight. Sign at the entrance to the Glen. If only they didn’t disturb the plants and animals. We knew of Julia, even though the internet was an infant, word had spread. I remember feeling so energized that another woman was doing what we were doing, yet simultaneously crying my heart out that this was a necessary act. Word spread about our campaign too; the first environmental action in modern day Irish history was aired on tv and newspapers. MI5 files were gathered as we pissed off the government, forcing them to listen to their conscience. We went to court. Vandana Shiva visited. Irish musicians played around the fire. Everyday people who could not give up their jobs & lives to live in the trees brought us food & supplies. Everyday life was work. Being a budding astrologer 20 years ago, I love that I can now read her book against the backdrop of her chart & transits, & wonder who she is 20 years on. 📡 Julia? Are you out there? All I have is her date & place of birth, no time. This means I can’t place her chart as it was when she was born, so I can’t determine if she was born in the day or night, what constellation was rising at her time of birth or where all the planets play their songs. But I can delineate a few things & I can see that Saturn in Sagittarius is as hot on her heels as it is mine! Coincidence? Saturn is conjunct her North Node, opposing her natal Saturn, likely causing her to ask similar questions about life purpose & direction that I too am being faced with. These last 2 years have likely grounded her in reality (Saturn in Sagittarius conjunct Neptune), made her reassess her vision, dreams and idea of utopia with either health issues or a depression of vitality. These cold hard realities will lead her to reassess the groups she’s affiliated with (Saturn conjunct North Node) and ask her to make decisions about how she uses her voice (Saturn in Gemini conjunct South Node), her authority and how she can keep her vision aligned with who she is (Saturn opposite Saturn, Jupiter North Node domicile conjunct Sun in Aquarius). “Butterfly” is a name that has been with her since she was 7. Saturn works in 7 year increments. When this Saturn cycle occurred for her at 7yrs of age it landed on her natal Pluto, and then Uranus. As deeply frustrating as Saturn-Pluto & Saturn-Uranus & Saturn-Saturn transits are, there is great change that occurs in our lives. A maturity is developed through hardship and a freedom from what restrained us prior propels us forward. It’s not surprising “Butterfly” became her nickname and not one like “Sledgehammer”. It’s also not surprising that her mark in the world is somewhat centred around this name, encapsulating her energy and message. Neptune, the great dissolver, transited her Venus also three times that year, forcing her to reevaluate what she truly valued, putting her resilience to the test and, as she wrote, changing the state of her skeleton (Capricorn) forever. She speaks of being among the Redwoods for the 1st time after the accident, and the deep healing journey she embarked on, knowing she needed to stay. When I walked into the forest in the Glen of the Downs, Ireland, I felt like I was home. The energy of the trees, the land my ancestors were born from and the people I met there all settled in me like family I’d always known. Julia was released from the confines of her healing journey into a Jupiter Return in 1997. This marks a 12 year cycle of growth and expansion. Some say it’s a lucky time, but Jupiter tends to expand whatever it touches, be it positive or negative. In Julia’s case, she was born with Jupiter conjunct her Sun in Aquarius, so this return of Jupiter was directly aligned with her identity, vitality, personal beliefs and philosophy. Jupiter-Sun people are often very generous, optimistic and expressive, deeply aware of morality and often influenced early on by religion, spirituality or the law in some way. Aquarius always reminds me of the expression, “A rising tide lifts all boats.” People born under this sign have a wonderful gift of being able to remove themselves from the equation as a self-important piece, and see issues as collective weights. The sum is greater than all its parts and at the same time, each part has a vital & unique role. Hello, Aquarius! Writing this piece I found her blog and poetry. She uses a lower case ‘j’ when signing her name and a lower case ‘i’ when referring to herself. The self sacrifice she displayed in her 20’s, an energy that often wains after the Saturn Return, is still evident in her writing today. 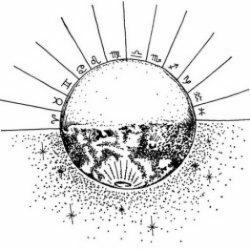 The Sun was at the final degree of Aquarius on the day of her birth (though, she could be a Pisces Sun if she’s born later in the evening). People born at these thresholds have a unique gift of being able to see the road forward while carrying the wisdom of the terrain just covered. It’s a maturing, a peak in the Aquarian terrain, where the baton will be passed over to Pisces with all of the wisdom acquired in the previous 29 degrees. She wrote this book aged 25 years. Pluto was conjunct her Neptune, and while this is a generational transit and not a personal one, she did express very publicly the cry from her/our generation: the reality of Neptune in Sagittarius’s dreams coming crashing down in the face of powers beyond our control. Pluto does a fine job of breaking into a million pieces the dreams we’d been carrying around about how life could be. When this transit hits we can see those pieces laying all around us. We feel broken & discouraged. We know how to put the pieces back together again JUST HOW THEY WERE – but that’s not the way forward. We’re asked to reimagine, to recreate our dream with our feet on the ground, based in a reality that incorporates living in this world with others and their visions. Julia’s 2 year tree sit joined the opposing forces of environmentalists and steelworkers. She personally negotiated with politicians by phone, 180ft in the air, to an end result of protecting the 1,000 year old tree that she lived in, with a 3 acre buffer zone around it. At the time, only 3% of this ancient Redwood forest remained. Responsibility was something she learnt very early, & paying her own way was the norm – getting her 1st job at age five (Moon and Venus in Capricorn). It’s here that Capricorn learns resilience, to be able to make something small stretch a long distance. That going without is a part of life & you just get busy saving & making things last. Quality is essential in ones choices in this case. With Pluto in Capricorn today, she will be experiencing a transit to her Moon and Venus, redefining the way she nurtures, herself and others, revisiting the early childhood memories that have imprinted a way of being, including a major shakedown and reorientation of her values and resources. Pluto spares no one. It was likely this Capricorn foundation, supported by a resilient Mars in Taurus, that helped her stick out 2 winters in a tree and withstand the onslaught of violence that was directed toward her in various forms. Julia’s Mars, however, is not just in Taurus, it’s aligned with fixed star Algol. While much has been written by many men about the expression of Algol so tightly conjunct a natal planet (no less Mars), some deeper excavation into the misogyny beneath the Medusa myth finds women / feminine / female presenting folks having to defend their power and personal expression. Julia writes in her book how the security guards and Pacific Lumber workers stood at the bottom of her tree for hours and days on end yelling hateful things to her, about her, yet having never met her face to face. Her human-loving Aquarian self lowered a photo of herself down the 180 ft rope, hoping to show these people that she was human, that she wasn’t a monster living feral in a tree, that she was actually someone they could relate to. Her tactic worked and out of it she developed some much needed human connection. Algol is a bright star positioned in the forehead of Medusa’s decapitated head, carried by the hero Persius. It has a mysterious flickering that dims its light at certain intervals, due to it being a binary star. The Arab word for Alcohol means “the demon” and we get the word alcohol from Algol. When we are intoxicated we are said to lose our head, just as Medusa did. Algol has an association with death and pain, and the oppressive violence of patriarchy. Julia’s Mars however (her energy, drive and determination), in combination with Algol is used in protection of mother nature. Like all of us, Julia has choices and freewill (a longer conversation for another time). With such a prominent, potentially destructive energy aligned with the planet that mythology says is the God of War, she could have used this energy for destructive means. Instead, she sat in that tree through 2 winters and endless criticism for the things she believed in, and for the benefit of all. It’s no coincidence that this book landed in my hands as Saturn transits Sagittarius. It’s asking all of us to be responsible for our freedom, to live our truth and to define what truth and freedom is as we navigate a rapidly changing landscape of life. When I lived in that tree in Ireland we used to talk about how fast the world was becoming. Now we just live in that fast world. It’s not impossible to change the direction we’re headed, and if I’ve learnt anything from my love of trees and astrology it’s that life is cyclical and each and every part of life is integral to its optimum function. Being all that you are, exactly where you’re at is the best place to navigate from. You only get one shot, don’t waste it trying to be someone else. Summer is never trying to be Winter, and apple seeds don’t grow into lemon trees. Next PostNext What does you MOON need?